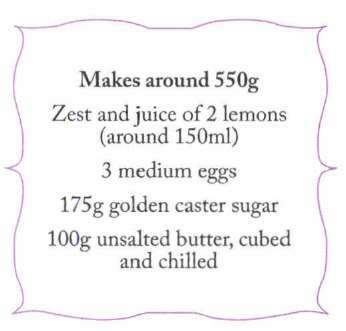 Put the lemon zest and juice in a large bowl with the eggs and sugar. Stir everything together with a wooden spoon. Add the butter then place the bowl over a large pan of simmering water, making sure the base doesn’t touch the water. Stir gently, allowing the butter to melt and the mixture to thicken, for about 15 minutes. The curd is ready when the mixture coats the back of the spoon. Strain, then pot into hot sterilized jars, top with wax discs and seal with lids. Cool, then refrigerate and enjoy within two weeks.